Several months after a debilitating stroke nearly 30 years ago, Zoe Morris ventured outside for the first time. The sidewalks were teeming with impatient pedestrians, and Ms. Morris suddenly found New York City’s familiar streets overwhelming. 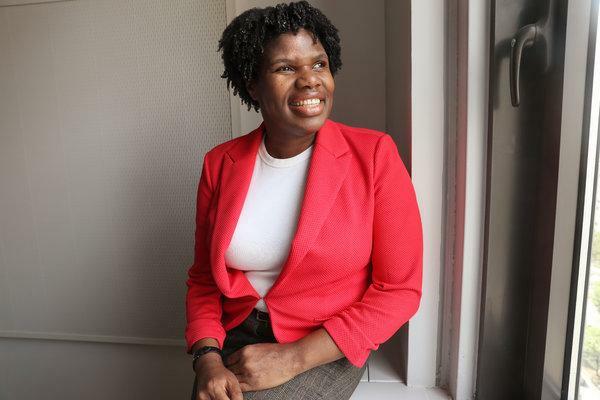 Nine years after her stroke, Ms. Morris completed her bachelor’s degree in media studies at Hunter College in 1996; she earned her master’s in English education from City College of New York in 2006. Additionally, Ms. Morris completed coursework to be a certified nursing assistant, and from 2007 to 2009 she worked for the Hospital for Special Surgery in Manhattan. Her entry into the medical field was inspired not by her own medical scare but by that of her closest relative. By 2012, her grandmother had grown feebler, and Ms. Morris stepped in as her primary caretaker. She empathized with her grandmother’s frustration at not being able to vocalize her needs, having had a nearly identical experience in the wake of her own medical crisis, and became adept at anticipating them. The death of her grandmother, in 2014, took a deep emotional toll on Ms. Morris. The following year, seeking a fresh start, she enrolled in the Grace Institute in Manhattan, which provides job-skills training to low-income women. Community Service Society, one of the organizations supported by The New York Times Neediest Cases Fund, used $233 from the fund to pay for two monthly MetroCards to cover Ms. Morris’s commuting costs to the training center. In February, Ms. Morris graduated from the institute’s administrative assistant program. She is now looking for a job. In addition to the independence and stability that steady income would provide, Ms. Morris said having a job would be an integral part of achieving normalcy, of feeling that she was truly moving at the same pace as others.